Integrate Social Media into Your Email Campaigns Now! First, what you are looking for is more recipients. You may be constructing masterpiece responsive email templates, but if there is no one to see them they won’t do you any good. You need a quality email list. When people opt in, you ask for some information – and we have talked about how less is more when you get there. You should ask for minimal data and segment later, but there is one thing you can do to build a better list and get much more. That allows you, first of all, to build another list of people who not only get mail from you but also are reachable through social. You get information: you can segment your list and personalize emails based on information publicly available on the social pages of your recipients. You get another channel: you can get people to follow you, target those who seem to be active on your list, expose your brand even more. You get a chance to promote more effectively, since you can synchronize messages in email and social media. For example when you send out an offer, you can mention it in a post, hint at some kind of advantage they might get if they get to that email in their inbox and open it (a discount for example). This way you can increase your open rate, CTR and ROI. It is also a very gentle way of reminding your followers and recipients of an offer they might want to take up on – much more subtle than sending out an email twice to reach the non-active. You should also promote your social media channels in your email – there are great ways to include CTAs in your newsletters, inviting recipients to tweet, post, follow. You can increase your follower base very efficiently this way. 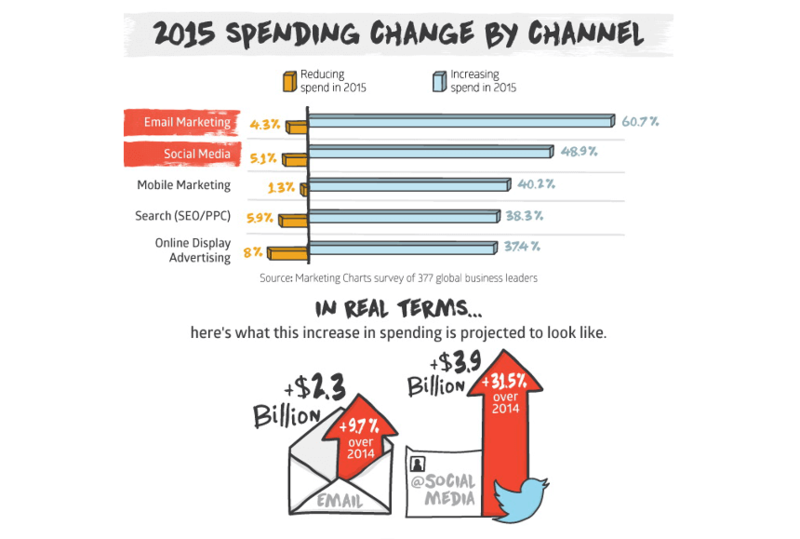 Email marketing and social media are the two areas online marketers are spending the most right now. Using only one channel or multiple channels without connecting them is a true waste of opportunity. It may take more time and energy from your team to integrate the channels, but with a more complex approach, you will see a much greater return – this we can guarantee!